PHILADELPHIA – Bridgette Mayer Gallery is pleased to announce that on April 5, 2016, the Board of Trustees of the John Simon Guggenheim Memorial Foundation approved the awarding of a Guggenheim Fellowship to gallery artist Eileen Neff. Chosen from a group of nearly 3,000 applicants in the Foundation’s ninety-second competition, Neff was one of eleven photographers selected from across the United States and Canada. 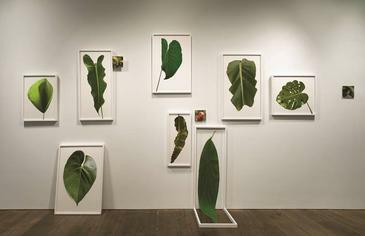 This fellowship follows Neff’s notable accomplishments including the acquisition of her “Leaf Wall Installation” in 2015 by the Philadelphia Museum of Art and the museum’s feature of this newly acquired work in their fall exhibition “Take Two: Contemporary Photographs.” Neff exhibited new works from an artist residency in Costa Rica at the gallery in her spring 2015 solo show “Traveling into View” and the fall 2015 group photography exhibition “Experience of Place.” Neff was also recently selected to participate in the Artist-In-Residence program at the Bernheim Arboretum and Research Forest in Clermont, KY and will be in residence there this May through June. Eileen Neff lives and works in Philadelphia. She received a BA in English Literature from Temple University, a BFA in Painting from the Philadelphia College of Art (now the University of the Arts), and her MFA in Painting from Tyler School of Art at Temple University. She has had recent solo shows at Bridgette Mayer Gallery, Pennsylvania; Bruce Silverstein Gallery, New York; Locks Gallery, Philadelphia; The Royal Hibernian Academy, Ireland; the Weatherspoon Art Museum, North Carolina; and the Institute of Contemporary Art, Philadelphia. Her work is held by numerous important collections, both public and private, including the Philadelphia Museum of Art; the Hood Museum of Art, New Hampshire; the Fabric Workshop and Museum, Pennsylvania; and the Pennsylvania Academy of the Fine Arts; among others. Neff is the recipient of many awards including grants from the National Endowment for the Arts, the Leeway Foundation, the Pennsylvania Council on the Arts, and the Pew Fellowships in the Arts.